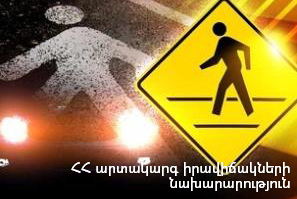 On February 13, at 09:16 an emergency call was received to “911” service that a car accident had occurred at 12 Arin-Berd street, Yerevan: a citizen had been hit by a car. The rescuers' help was needed. It turned out that “KamAZ” car had hit E. S. born in 1952. The rescuers removed the corpse to ambulance car.